In my grand scheme to read books that are on my own bookshelves this year, I finally picked up My Heart's at Home , by Jill Savage. I think I've been staring at it for about 2 years now. It's kinda interesting reading books just because they've been staring at you and you know you need to get to them. You don't really know if you are going to love it or not and sort of enter the book half heartedly as a result. Or, at least, that's what I do. I never got beyond the half hearted feeling about this read but I don't know that that's necessarily the book's fault. My Heart's at Home isn't the best book I've read on home and motherhood, nor is it (anywhere near) the worst. I found it to be a nice pep talk more than anything else. If you are feeling discouraged about the value of your work as a stay-at-home mom, I certainly would recommend this book as an encouragement to your weary soul. Savage makes a good argument as to why it's helpful to have the wife and mother at home to help the house run more smoothly if for no other reason at all (although there are a great many other reasons). This book doesn't in any way address arguments about gender equality and I was glad of it (as those type of arguments pretty much flat out annoy me anyway for all the emphatic statements which everyone feels compelled to make). Savage is here with this book to encourage the stay-at-home mom. Plain and simple. Part of the reason I think I might have felt half-hearted about this read is because I feel very confident about my chosen road. My husband and I are in complete agreement that the right thing for our family is for me to stay home. Things are exactly the way I would want them and I feel very blessed that I can stay home with my kids. I don't feel cheated by not having a "career." I am not undervalued by my husband. He wants me home; I want to be home. We have the same goals and everything runs smoothly in our household surrounding this concept. I am content even if certain groups of peoples would like to believe that I am not. They would be very wrong. All that said, I like being home but that doesn't mean that somedays feel very long and there are struggles with the kids that sometimes that leave me feeling a bit exhausted. When those times come though I think Jonathan and I have a pretty good system going and he doesn't just begrudge my escaping the house to spend some time alone. In fact, he encourages it! We've got a system and it seems to work well for us. I have time to breathe when I need it and yet I'm still available to my family as they need me to be and as I want to be. As much as I don't care about the nay sayers who think I'm either "less than" the more career minded female or somehow trodden down and dominated (I laugh at the absurdity) I really do appreciate it when people come along who are supportive of the concept of a stay-at-home mom. For that reason I appreciated My Heart's at Home . Jill Savage clearly cares about ministering to young wives and mothers and encouraging them as they serve their families. That is admirable and I always feel comforted to know that there are those in the world who are there to cheer me on instead of try to convince me that I'm being dominated in some strangely bizarre way and should really be thinking more about my life outside of the house instead of inside. In reading My Heart's at Home I thought of a few friends who would really appreciate and benefit from this read. 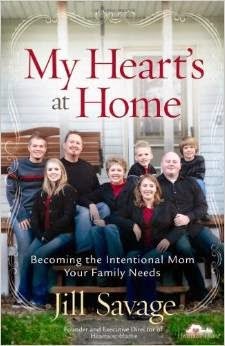 Any mom who is new to the concept of staying home and tending to family "only", or who wants to be a stay-at-home mom but is surprised to discover what all that means, would be greatly encouraged and inspired by this read and so I think it serves a great purpose. I guess what I'm saying is that although I wasn't "wow-ed" and blown away by the read, I am glad to know about this resource and am happy to share it with my friends. We need more Jill Savages in the world who aren't afraid to talk about what a beautiful gift it is to be a wife and a mother. She gets that it's hard work but rewarding work. She wants to encourage moms and I think she does so admirably and well. Yes, I recommend it. If you are feeling a bit "dry" in your role as a mother, consider this one for a pep-talk and pick-me-up. There is positively no shame in seeking that out when you need it!! I love/hate how Amazon tells if you've already purchased an item. When looking up this title it told me that I purchased this back in 2011. Ok, so I've been staring at it for four years. Thanks for that, Amazon. Thanks.